These are not as much program notes as a narrative of what interested me in programming these works. These are not as much program notes as a narrative of what interested me in programming these works. This recital consists largely of works that are somewhat ‘off the beaten path’ in today’s programming fashions for one reason or another, but they are all works that I believe in. My intention in programming them was, to the extent I can, to advocate for them and hopefully generate some interest in these pieces. So thank you in advance for your indulgence! Emanuel Moor (1863-1931) was a Hungarian composer who studied in Vienna and Budapest. He is also somewhat known as an inventor of musical instruments, the most famous being a double keyboard, coupled at the octave. As a composer he was little known, save for the tireless patronage of Pablo Casals who insisted on programming his music whenever he could. Moor was undoubtedly his own worst enemy in terms of building his reputation, managing to consistently rub everyone the wrong way (It brings to mind the old joke: “George Szell is his own worst enemy” … “Not while I’m alive…”) Here’s a brief description of Moor by Casals (as quoted my J. Ma Corredor) “Q: did Moor have a difficult temper? A: Yes, he was a strange character. He got on the wrong side of anyone he met, with the result that they always wished to get rid of him. He talked to everyone, either a celebrity or an unknown person, in a brusque direct way… I’ll give you an example: Moor ate like a lion, and to tell you the truth it was not very pleasant to see him at the table when, with his teeth protruding like an animal, he gobbled the food as if he were starving. However, I knew the reason there was behind the mind of this man” My teacher, Zara Nelsova, learned the Prelude when she was working with Casals and programmed it regularly early in her career. My programming it here is a tribute to her, and her continued influence in my life (and in those of so many others). Her definitive recording of this piece is available as the first track in Cello Classics’ Great Moments in Cello Playing CD and shouldn’t be missed. Ernst von Dohnanyi (1877-1960) was another Hungarian composer schooled in the Viennese style. Brahms encouraged him early in his career and arranged the Viennese premiere of his Op. 1 Piano quintet, which is still played regularly today. This sonata is also an early work, written in 1899 when he was just 22 years old. It was written in part as a tribute to his father who was a mathematician and amateur cellist (like my own father!) Dohnanyi lost both his sons during World War II, one of them executed by Hitler for his plot in the unsuccessful assassination attempt, and Cristoph Dohnanyi, the conductor, is his grandson. Dohnanyi was unjustly called a fascist by the communists in Hungary and had to flee, spending most of his post-war years living and working in Florida. I came upon this sonata in the course of reading through stacks of music and found it immediately compelling. I can’t explain why it is not more popular, except that perhaps it is overshadowed by the sonatas of Brahms, which are similar in language and style, and the fact that the piano part is incredibly hard. Alexander von Zemlinsky (1871-1942) is a composer who has been garnering much more attention recently. Born in Vienna to immigrant parents, he was also encouraged by Brahms and had initial success as a conductor. He proposed to Alma Schindler (who was later to marry Gustav Mahler and virtually every other important artist in Vienna) and she initially accepted, but her family objected on the grounds that he was too unknown and too ugly… Presumably if he was going to be that ugly, he should have at least been more famous. Zemlinsky was also friends with Schoenberg and informally taught him counterpoint, marking the only formal instruction Schoenberg ever had. (Hmmm) These three short pieces are musical trifles, but quite charming in their own way. 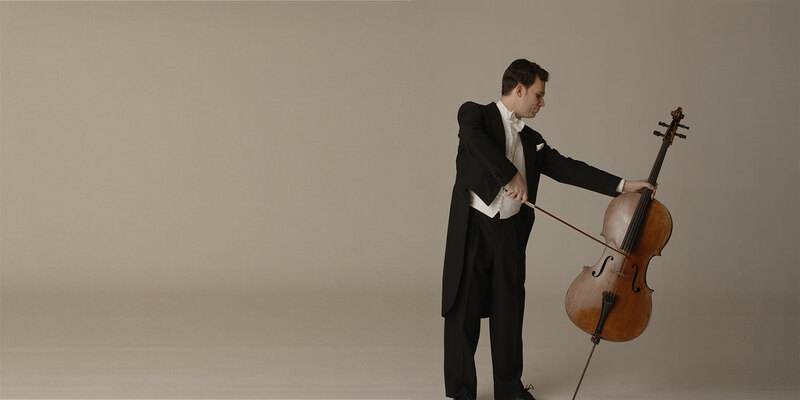 They were written in 1899 as a going away present for Friedrich Buxbaum, who was later the principal cellist of the Vienna Philharmonic for over 40 years, but at the time was leaving Vienna to become the principal cellist of the Royal Scottish National Orchestra. The music was re-discovered only a few years ago and published this year. To the best of my knowledge this marks only their first North American performance. Samuel Barber’s (1910-1981) Cello Sonata is probably the best known of the pieces here and requires little explanation. It dates from 1932 (when Barber was the same age as Dohnanyi when he wrote his sonata) and was written in collaboration with Orlando Cole while they were both at Curtis. I remember Sammy Mayes relating Barber’s regular intrusions into his lessons with Salmond. Sammy said that each time Barber came in, he had more of the Sonata completed and less hair! This work is hardly unknown, but it is odd that it is not played more often. Robert Schumann (1810-1856) certainly needs no introduction. I came upon the cello version of these Romances in an early recording of Maurice Gendron and immediately fell in love. Originally written in 1849 and intended for performance on violin or oboe, this style of piece was widely expected to be transcribed for other instruments by amateur musicians playing in their home. They are three songs without words, varying little in the tempo, but full of classic Schumann melodic material. Piatigorsky’s arrangement of this Schubert four hand work has long been one of my favorites, dating from the classic Black and White movie where he matches wits with ‘Stella Transom.’ It’s a charming piece, but I admit that I programmed it partly to force myself to try to learn a passable staccato. While it’s a far cry from Piatigorsky’s effortless stroke, I’ve arrived at something that’s generally passable, though I make no promises! Finally a word about Bimbi- not the latin plural of Bimbo, but Bartolomeo Bimbi, the maker of the cello I am trying out on tonight’s performance. While I had originally hoped that it would not be too difficult a transition from my cello, I’ve found that it’s a bit like trying to play basketball in dress shoes. Rene Morel claims that changing cellos is like changing girlfriends and that it takes at least a month to readjust. Given the expense involved, I’d say it’s more akin to changing wives…I’m interested to hear opinions on the cello, but I’m going to unfairly blame the cello for any out of tune notes produced this evening. My deepest thanks also to Evelyn, for learning far more notes than I did, and playing them so well. Certain impositions, like making someone learn the Dohananyi, can only be made on family. Thank you for coming.